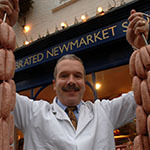 With a unique family recipe dating back to the 1880’s, using prime cuts of hand boned free range British pork and our secret blend of herbs and spices, Powters Newmarket Sausage is the result of four generations of sausage making skill. The authenticity of these award winning sausages and their reputation for quality are now recognised throughout the EU, having become the UK’s 50th Protected food name. This means they can only be made in Newmarket to the original recipe and our controlled specification. We use only traceable high quality meats from approved farms and suppliers. This ethos extends to the full range of meats we supply to restaurants and caterers throughout East Anglia and the London area. This reputation, as well as our ability to work closely with chefs, makes Powters the one-stop shop for locally sourced provenance.